Michigan State is headed back to the Final Four, where they'll meet Duke next Saturday night. Afterward, Wisconsin takes on the still-unbeaten Kentucky Wildcats. Overtime wasn't as close. The Spartans won 76-70, while legendary point guard Magic Johnson (who led the Spartans to the title in 1979) smiled on from the stands. 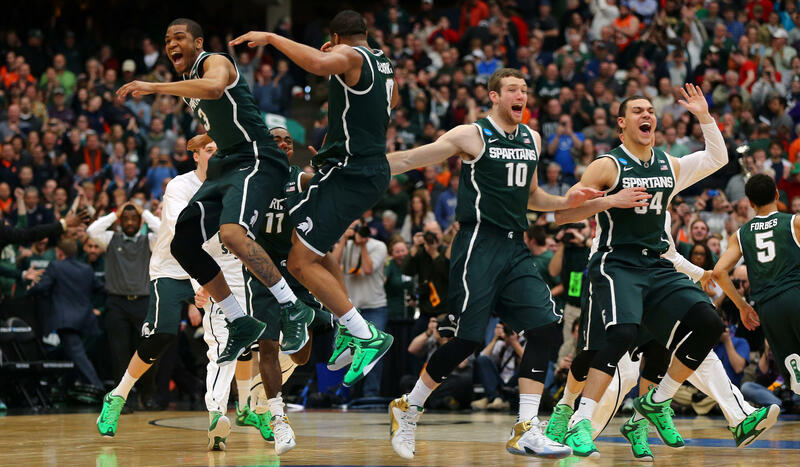 This is the Spartans' sixth trip to the Final Four since 2000. In Houston, 1-seed Duke met 2-seed Gonzaga. Duke's star freshman Jahlil Okafor, the presumed #1 pick in this summer's NBA draft, was looking to rebound from a tough showing against Utah, where he scored just six points. Tonight, he only scored nine, but his teammates again picked up the slack. Duke held an arm's-length lead for most of the game and won 66-52. Once the quintessential Cinderella team, but now a regular tournament heavyweight, Gonzaga has actually never been to a Final Four. Duke, on the other hand, is headed to their 16th. Kentucky and Wisconsin sealed their spots last night — Kentucky in a total thriller over Notre Dame, who held a small lead for most of the game before losing control right at the end. The first game — Michigan State vs. Duke — tips off Saturday night at 6:09 PM Eastern Time.